Burslem’s career choice was sparked by a part time job he held at The Four Seasons Hotel in Vancouver which prompted him to enroll at the Vancouver Community College Culinary Program. 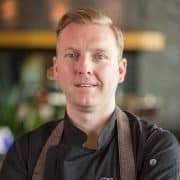 Following his graduation in 2005, he worked his way up the culinary ladder in a variety of progressive culinary positions in Vancouver at the Four Seasons Hotel, the Marriott Pinnacle, Fairmont Waterfront, and in Seattle, WA at the Fairmont Olympic Hotel. He spent three years in Seattle making a name for himself as Chef of the award-winning AAA Four Diamond Georgian Restaurant at Fairmont Olympic Hotel, and also garnered the hotel’s Leader of the Year in 2011. As Executive Chef at North America’s top airport hotel, Burslem showcases the fresh and unique local ingredients the Pacific Northwest offers. His goal is to provide delicious dishes that tell a story through a connection to the region and people, and promises a ‘home away from home’ for dining travelers.